Go behind the scenes with the National Zoo's panda team as they raise a baby to adulthood. On an April afternoon, he’s rolling around in the grass, wrestling with his mom, climbing a tree, and then scooting right back down. When he finally wears himself out, Bei Bei slumps over a tree branch, legs dangling, and falls into the kind of deep sleep only a spirited youngster can achieve. Being a young giant panda takes everything he’s got. And raising him? That'll take everything the Smithsonian Institution's National Zoo has got, and then some. Bei Bei—whose name, bestowed by First Lady Michelle Obama and China's First Lady Peng Liyuan, means “treasure,” and more colloquially “baby,” in Chinese—is a twin born in August 2015. Unfortunately, the animal was a runt and developed lung problems. Despite experts’ best efforts, “sadly, he died four days later," Comizzoli says. Bei Bei has more than survived—he’s blown through milestones his keepers set for him. He was out of the den and comfortable outdoors much earlier than expected, and his growth has been fast and furious. Meanwhile, there's a love for Bei Bei, both within and outside of the zoo, that’s expanded as fast as he has. Even months before he went on public exhibit, he had millions of people watching him via the Panda Cam, an online window into mother and cub’s private world. More than 7,400 people showed up in January for his public debut (watch the video), and in February his fans were thrilled to see him emerge from his indoor pen for the first time. Conceiving and breeding a panda is not an easy process. Mature females are able to conceive only about two days a year. In addition, newborn pandas are really fragile creatures. Panda cubs are born blind and with only 1/900 of their mother’s weight. They cry loudly to get their mother's attention. Cubs start to eat bamboo around six months and stop nursing at 18 months, spending more time alone. In the wild, a cub leaves its mother at 1.5 to two years of age, depending on if its mother has conceived again. 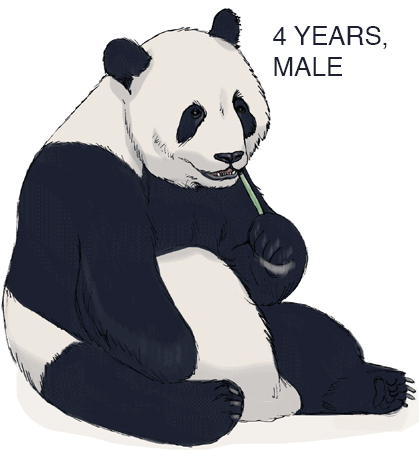 Females are fully mature and able to breed at four years, and males at six, while captive giant pandas mature earlier. Explore the interactive time line to view milestones. However, breeding pandas hasn’t come easy to zoos in the United States. While panda centers in China churn out cubs in double digits each year, facilities in North America aren’t equipped to handle multiple adult bears, nor is it their mandate to generate a lot of animals. So each cub is, indeed, a treasure. The National Zoo has displayed giant pandas since 1972. That’s when China’s then Premier Zhou Enlai sent a pair to Washington as an envoy of friendship after First Lady Pat Nixon expressed how cute they were. Over the course of 20 years, the animals produced five cubs, but none lived beyond 24 hours. “Management of the animals back then was very different, and we had only a vague knowledge of what to do for them,” says Comizzoli. It wasn’t until 2005 that the zoo successfully used artificial insemination on a new breeding pair on loan from China, Mei Xiang and Tian Tian. The resulting cub, Tai Shan—fondly nicknamed "Butterstick" due to panda newborns' tiny size—remained fully in his mother’s care as an infant, though he was heavily monitored by keepers via live video and routine exams. 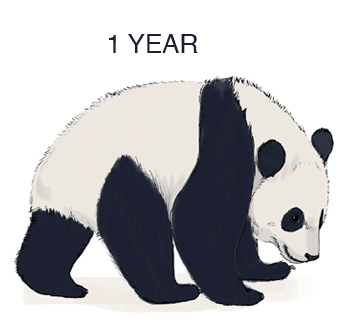 And now her brother Bei Bei is thriving at nearly a year old. Notably, Bei Bei’s early care, and that of his deceased twin, followed a twin-swapping protocol developed in China that allows a mother bear to focus on one cub at a time, improving the odds that both survive. Female pandas have a very difficult time raising two cubs successfully on their own; in the wild, usually only one makes it. 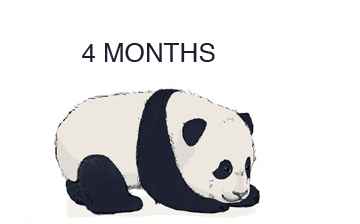 Considering a giant panda’s feeble beginnings, it’s hard to fathom its rapid transformation. Animal keeper Marty Dearie handles Bei Bei. The cub is now learning behaviors that allow keepers to better handle him. 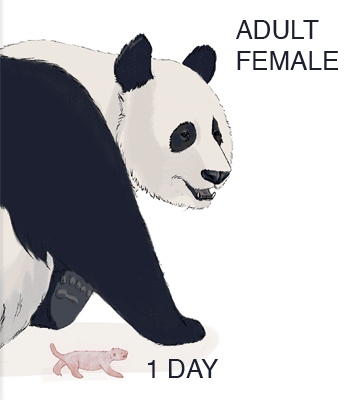 Imagine a blind, naked, ratlike creature with a voice to match: “That’s a panda at birth. All it does is squawk really loud to tell its mother where it is,” says Comizzoli. In his second and third month of life, Bei Bei began to experience a more animated world—his eyes and ear canals opened, making communication with his mother a two-way street. Then came those landmarks that thrill human parents and pandakeepers alike: First steps, in a panda’s case on all fours (November 9); first tooth (November 19); first nibble of solid food (December 20). And in early February this year, on just his second trip outside of his birth den, Bei Bei tested his tree-climbing abilities, with his mother doing a paws-on assist from below (watch video) when he struggled to get down. Keepers stocking bamboo in Bei Bei's enclosure. Adult pandas eat mostly bamboo. Pandas are one of the fastest growing mammals on Earth, and Bei Bei has been particularly speedy putting on the pounds. Indeed, the newborn more than doubled in size in his first 12 days, tripled within 16, and now, at nearly 11 months old, weighs about 61 pounds (28 kilograms)—just about 200 times his birth weight. He still has a ways to go, but the baby boy promises to be an impressive adult; wild males may grow to six feet (1.8 meters) long and weigh some 250 pounds (113 kilograms), and captive ones can be bigger. Bei Bei has a short attention span, not uncommon for a youngster with so much to explore, so training comes in five-minute spurts a few times a day. And this panda loves to eat. “Of all our cubs, he’s been the most interested in trying new foods,” says Thompson. He’s also fond of apples and leaf-eater biscuits (treats packed with vitamins and ingredients like soy, corn, and flaxseed oil), she says. Bei Bei is now in basic training, learning behaviors that allow keepers to control him in an unexpected situation and handle him as needed, such as for occasional veterinary care. Also, he’s doing “target training,” learning to touch his nose to a designated spot—again, a way to give his keepers control. Soon he’ll move on to standing, lying down, presenting his paws, and opening his mouth—useful for dental checkups. He has a short attention span, not uncommon for a youngster with so much to explore, so training comes in five-minute spurts a few times a day. His roly-poly cuteness and quick smarts aren’t his only virtues, his keepers say: Bei Bei is his own bear in a lot of ways. That makes it fun for keepers, whose work begins around 6:30 a.m. when the bears are ready to go outside. Bei Bei is doing "target training," or learning to touch his nose to a designated spot as a way to give his keepers control. “We come in and set up the yards with bamboo and other foods, plus enrichment items—things that contribute to their cognitive, sensory, and social well-being,” Thompson says. Those might include a feeder that requires problem-solving skills to open or spices set around the yard to give them something new to smell. As with kids, the bears make a new mess almost immediately when they come back inside, so a keeper’s job is never done. Despite such unglamorous tasks, Bei Bei gives back daily: “When we’re there he comes over and wants to interact,” Thompson says. Bei Bei hugs his mother, Mei Xiang. He'll stay with his mother for around two years, and then, at four, he'll move to China, where he's likely to become part of their breeding program. Keepers still have their eyes on Bei Bei throughout the day, although he’s no longer on 24-hour watch. Before long the cub’s need for mother’s milk will dwindle; already, Mei Xiang is cutting him off early during his twice-daily nursing sessions (soon to be once a day). He’ll soon chew on more bamboo—adult pandas may eat up to 40 pounds (18 kilograms) of the stuff each day. But even as he becomes more independent, Bei Bei, like cubs in the wild, will stay “home” with his mother for around two years. At four, he’s slated to move to China where he's likely to become part of the breeding program. But even far away from home, he'll always be D.C's little treasure. Jennifer S. Holland is the author of the Unlikely Friendships series about unusual animal relationships. Her new book, Unlikely Friendships: Dogs, will be out in August.